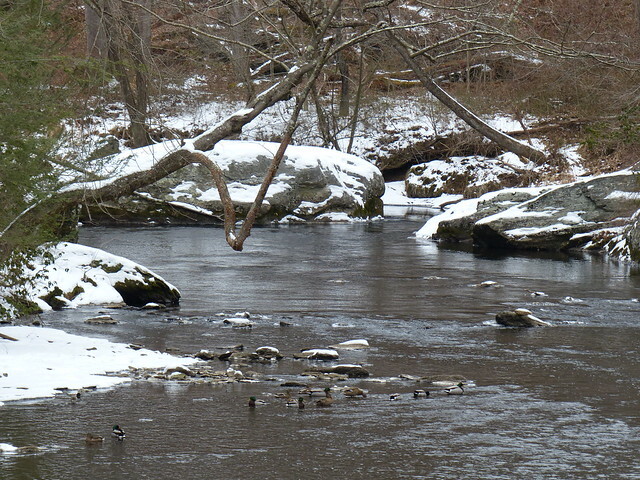 The Gunpowder River is clear, flowing at 60 CFs and is just over 33 F. While we have not many folks braving the cold weather, a few folks from out west who thought the weather was “good enough” gave the Bunkerhill, Masemore and York Road stretches an honest try this week. Reports coming back pointed to the effectiveness of zebra midges in the #20-24 range behind rubber legged stoneflies. If you’re dead set on giving the Gunpowder a try, make sure you have an extra set of gloves in your vest or pack and bring along a wading staff to test the edge ice. New snow along the River has improved the footing on the trails this week. With more snow in the forecast and rain on the way, these images from Falls road this morning simply won’t last as the snow and ice lets go upstream along the ridges. This week most of our store traffic as been comprised of folks picking up last minute items before boarding planes to warmer fly fishing destinations like Argentina, the Bahamas, Belize, Chile and New Zealand. We’ve also had a fair share of people picking up Maryland fishing licenses for 2015. If you’re ready for one please bring along your DNRid, last year’s license or a driver’s license and check or cash for payment. This entry was posted in fishing report on February 21, 2015 by Theaux Le Gardeur. 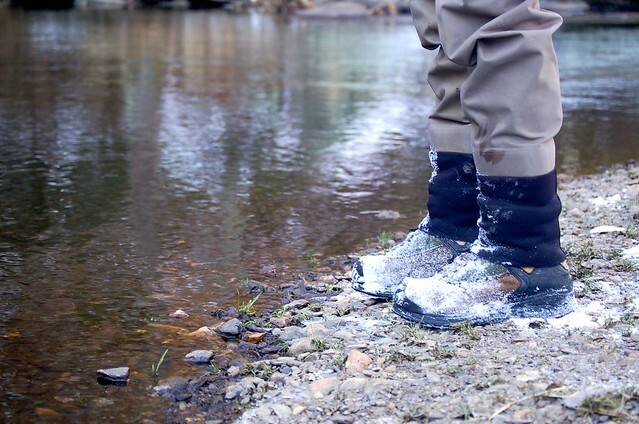 The Gunpowder River is clear, flowing at 70 Cfs and is 38.5 F. Thanks to Emma Reider for this great mid-winter shot of Josh in a pair of Simms Guide boots along the Gunpowder River. We’ve heard a few reports of stoneflies buzzing around in the meadow stretches of the lower catch and release section of the River. Not many fish are taking dries but the River is at a perfect level for high-stick nymphing. If you’re dead set on fishing dries, look for a few BWO’s at Masemore Rd. Little black flies or snow flies start to come off this time of year in the upper catch and release section. 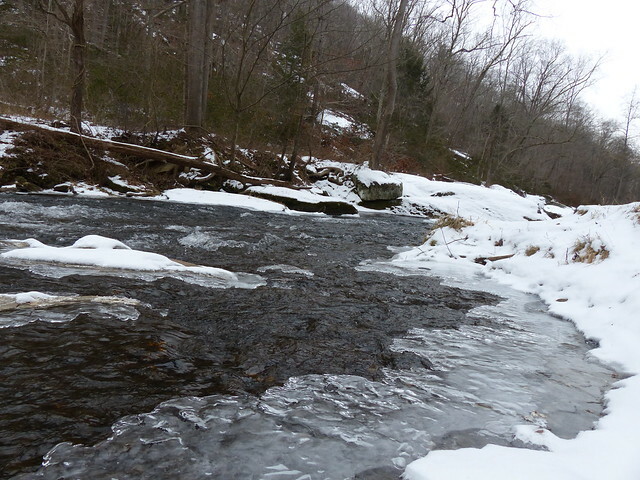 As long as the trails are clear of ice fishing upstream of the Boulder Pools above Falls Rd is a good bet. Give them a go with a #22 Griffith’s Gnat or Mike Bachkosky’s snow fly pattern. Slow down everything. With water temps in the mid-30’s the fish aren’t going to be very active. With this in mind try to cover slower water with small Hare’s Ears nymphs and midges. Gunpowder trout see a lot of very realistic patterns so don’t be afraid to tie something wacky on. Remember that just because it is cold doesn’t mean that you can’t catch fish. This entry was posted in fishing report on February 5, 2015 by Theaux Le Gardeur.